Many people ask about our current projects and it is time for me to talk about what we've been up to. 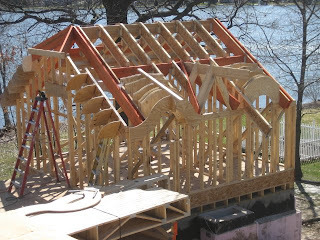 We are building a custom home at Pewaukee Lake which is the largest and most detailed project we've ever completed. The photos and subjects of discussion are neverending - I have a collection of 2000+ photos from the construction of the home so far. The subjects are endless because every corner of this home is unique. It will be a Green Built Home and a Wisconsin ENERGY STAR Home. It is designed and built with details to look like it is already 100 years old. It has the most modern and efficient heating & cooling systems in it (geothermal, ground-source heat pumps, radiant floor heat). It has an indoor fitness center with a basketball court under the garage. There are PV solar (electric) and domestic hot water solar panels on the roof. The point is: The home at once represents the image of a home that was created over time, but rather this one is being built with aging already built-in! It is at once a new home and also a "remodeled" home. There are 5 separate elements to the design: the "storybook cottage", the "chapel", the "barn" garage, the "English Manor", and the "new timberframe." The challenge was to make these parts of the house into a cohesive whole, but to have the house represent a creation that was added to over time. It is as if these separate, smaller buildings were moved onto the site and connected together over time, in a slightly hodgepodge way as was often the pragmatic way of our forefathers. In reality, this was all intentional, planned, and debated time and time again. Every square foot of space in the home was reviewed to make it functional, if not multi-functional. There are several examples. The "guest cottage" can be an in-law suite, or even an owners suite on the main level of the home should anyone ever suffer disability. The downstairs craft room doubles as a guest bedroom, and the adjacent childrens' bunk room is sound-proofed for their benefit while it can also serve as a mini recording studio. A formal sunroom was eliminated, but instead a sunny, private ingelnook will be created in the cooridor linking the "guest cottage" -- it yields an extra piece of privacy for guests and can again double as a sleeping area for additional guests. There is no dedicated home theatre room. The clients were inspired by their trips to Europe - specifically the Cotswolds in England, but also trips to Italy. While the Italian Villa was considered, in the end the old English cotswold style won out, with a bit of storybook imagination added in. All in all, the floor plan is about 1/3 smaller than the original schematics. This, in and of itself, will save the owners money and energy, and in turn makes this house greener than it might otherwise have been. Additionally, the house has R-80 attic insulation, R-25 or better in the walls, and has received two intermediate Wisconsin ENERGY STAR Homes inspections so far. The final results will come in after completion late this summer. Please subscribe and stay tuned! 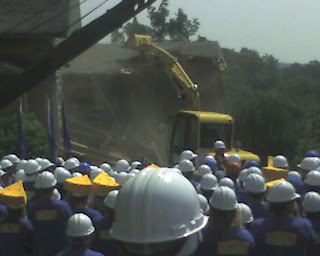 I spent about 3 days working at the Extreme Makeover Home Edition project in Richland Center in July 2008. Lisa and I also spent the first day there, known as the Braveheart March or the Blue Shirt March. The construction process was thrilling but challenging. We at Degnan Design Builders were there to help Twohig Construction, doing the trim carpentry for Veridian Homes. Lisa and I arrived early Saturday morning in Richland Center. There were hundreds of people waiting to be shuttled to the site about 7 miles outside town, tucked high on a beautiful farm hill. 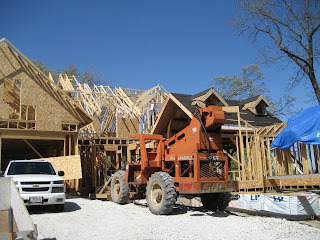 Our job that day was to be part of the cast, as the army of Blue Shirts arriving to help build the new home. It was demolition day! The story of the demolition was a "Storybook Demo" because the owner, Shelly Anders, is an elementary school teacher. It was a little like "The Little Engine that Could" since there was a small excavator "learning" how to tear the house down with the help of a bigger excavator. As we were back from the center of the circle formed around the Design Team, we could hear little of the story until we actually saw the TV show several months later. The Design Team members were all present, including Ty Pennington, Paige Hemmis, John Littlefield, Paul DiMeo and Eduardo Xol. There were lots of "takes", they shot and re-shot the march and the demo from lots of different angles, and of course Ty had to climb up on the pile of debris with his camera for some shots for the family. On Monday morning, I got a call from Mike Twohig asking me to get out to the site sooner than we had planned. Our trim shift was supposed to be from 3am to 3 pm Tuesday July 29. Instead, Anthony Caracci and I packed up immediately and headed for Richland Center. The funny thing is, just before we arrived Gary Zaicek from Veridian also called with a similar request, but he had better news for me: He wanted Anthony and I to work in the production tents, helping build the special projects for the design team. Well, twist my arm! Work on the special projects and maybe meet a designer? We were thrilled. Little did we know, we'd do more than just meet them in passing. By the time we arrived on site around noon, the house looked as you see it in the third photo. The framing was complete. In fact the exterior was half done! Anthony and I quickly got started in the production tent. My assignment in the production tent was cutting tube steel to make brackets for Paul DiMeo's special project, which was an "outdoors room" for the 2 older boys who live at home. Anthony began building furniture for two different things. He was involved in building the bed for Shelly Ander's bedroom, which was Ty Pennington's special project. He also helped build the computer desk for John Littlefield's special project, the younger son's bedroom. Around 6 PM, we were thinking about dinner and winding down so we could rest for a few hours. To be back at the site and be set up by 3 am, we figured we'd have to be up and at it by 1 am again. Those plans quickly changed, as David Simon from Veridian approached me with a special assignment: to re-build the stairway! Upcoming parts of the blog: Stay tuned for more! Home - for a while. Punch list - the most thrilling part, got to see it all! An hour in the bedroom with Paige Hemmis. Installing furniture.